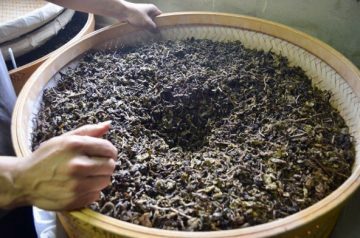 Wulong tea or ‘Oolong’ tea, refers to one class of semi-fermented teas, originating from the WuYi mountains in Fujian, China. The different spellings are due to competing systems of Romanization. ‘Wulong’ comes from the ‘HanYu PinYin’ system, and Oolong from the ‘Wade Giles’. Regardless of which spelling you prefer, Taiwan has some of the most interesting Wulongs in the world — from lightly oxidized ones like ‘BaoZhong’ in northern Taiwan to more highly roasted ‘DongDing’ in mid-Taiwan. And, despite the Taiwanese government’s more recent wholesale chopping down of high mountain tea bushes in the south from majestic places like Alishan, ‘High Mountain Wulong’, is coveted.